Here's the little bedraggled bouquet of white . . . creamy white, not bright white . 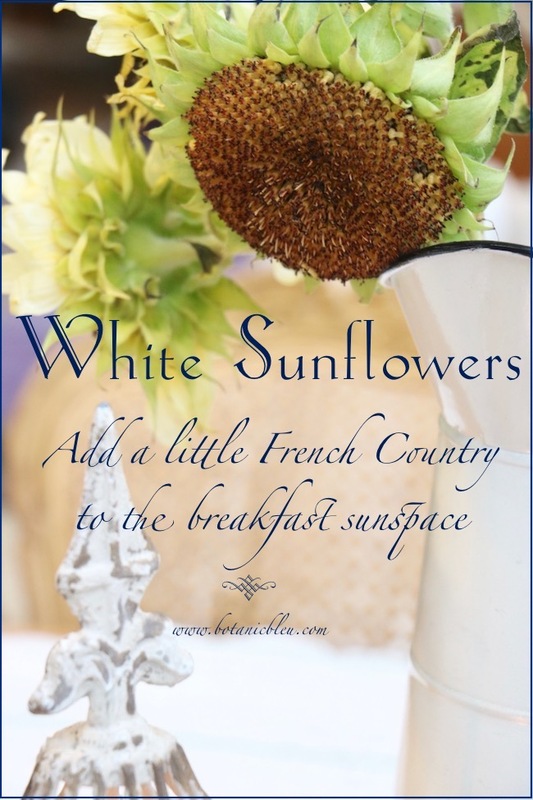 . . sunflowers adding a little French Country Fall to our breakfast sunspace. Outside, rain has been pouring for two days and skies are heavily overcast. Nonetheless, the sunspace is still bright from all the natural light from the windows and overhead roof windows . . . and the bouquet of sunflowers. How did I find these little rays of sunshine? Have you ever missed a turn while driving, even though you were getting verbal directions from your cell phone? It happens to me more than I like, but my car does know how to turn around and get back on track . . . and how to take advantage of an unplanned outing. Smart car! While driving in Dallas headed to an appointment last week, we missed a turn, but instead of making a U-turn, we took advantage of the unexpected detour. The Dallas wholesale flower market was only a couple of blocks away, we were way early for the appointment, and decided, "Hey, we are so close, why not take a walk through the flowers to see what is available?" If you have a chance, you should walk through a wholesale flower market. It is so exciting to see rows and rows of buckets of all kinds of beautiful flowers, many of which I never know the proper name. TIP: If you are looking for special flowers, ask your local florist about them. She or he may be able to order them from a wholesale supplier who can get flowers not readily available at your local grocery store. We asked about topiaries which were not in stock at any of the vendors . . . not yet, but coming in November. 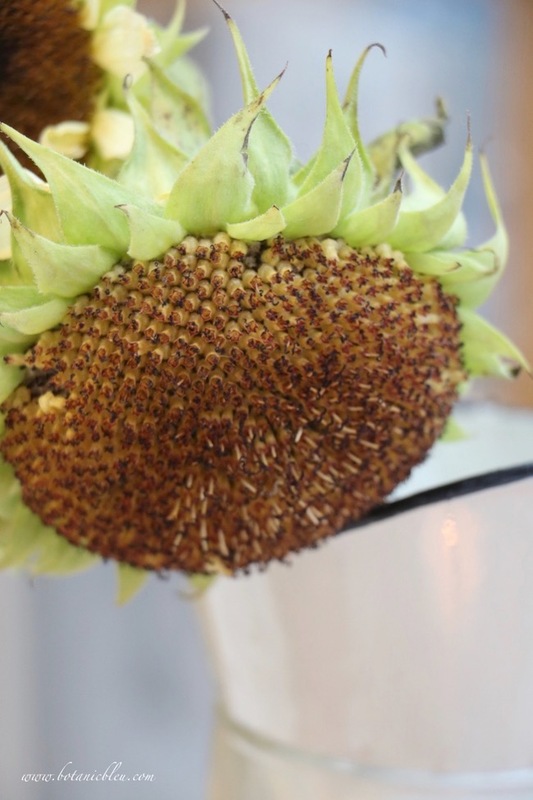 As we were turning away to head out, there sat a bucket of white sunflowers on the floor right in our path. They were past their prime, and I looked at all four remaining bouquets for flower heads with a little sunshine left in their blooms. No bouquets were perfect, but they were what I have been searching for. I knew one of the bouquets was going home with me . . . after all, it was destined . . . a wrong turn in Dallas, just down the street from the flower market. The largest flower head had already lost most of its petals, and lost the rest of them before I arranged the flowers on the breakfast table. But, look at that beautiful seed head. 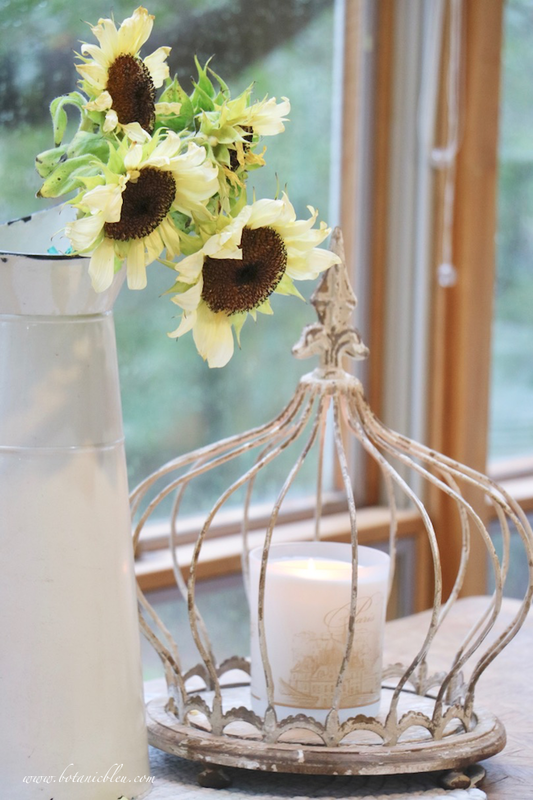 Arranged in a traditional French watering can, the sunflowers go perfectly with the rustic wire cloche holding a Paris candle. 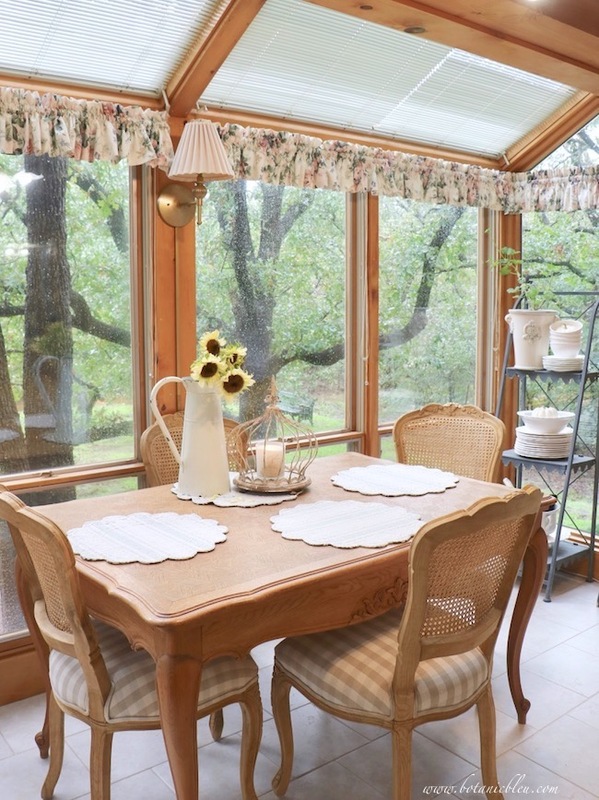 Together the sunflowers and the wire cloche are giving a French Country Fall to the breakfast sunspace. 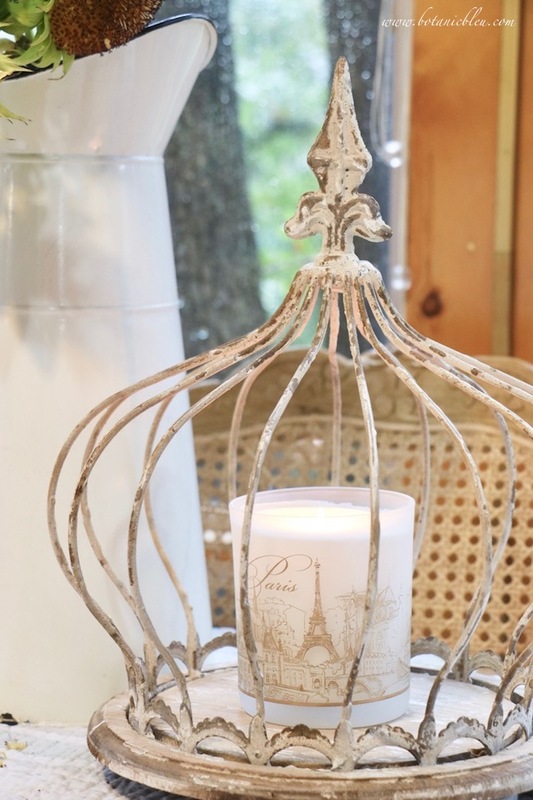 You know the phrase, "perfectly imperfect." Yes, just perfect for me on a day I needed a little encouragement. This summer has had its trials with a series of low-grade infections that doctors have not been able to clear up. Days, no, weeks of no energy, discomfort, dragging around, antibiotic reactions, canceled fun outings, multiple doctor visits, and still an infection. 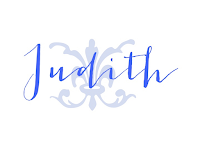 The appointment in Dallas was to a specialist who I hope will have the answers needed. 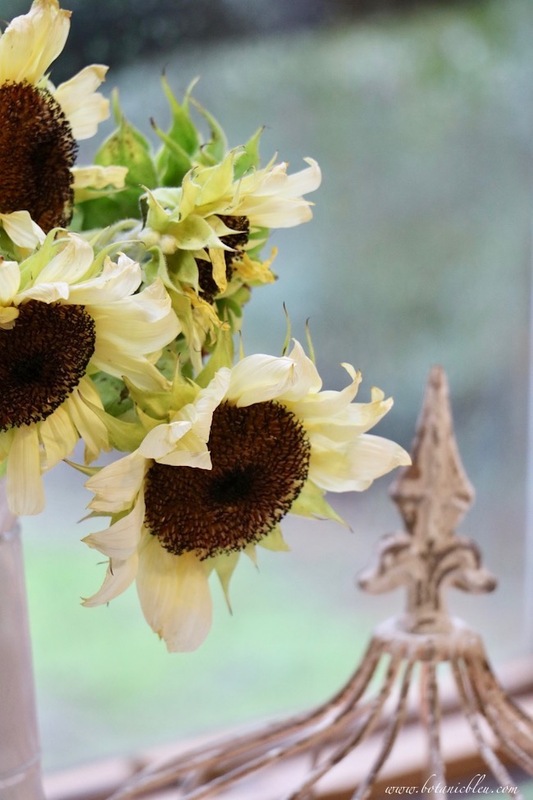 Finding the white sunflowers was a moment of pure joy. Regardless of their bedraggled state and my bedraggled state . . . A little sign not to give up . 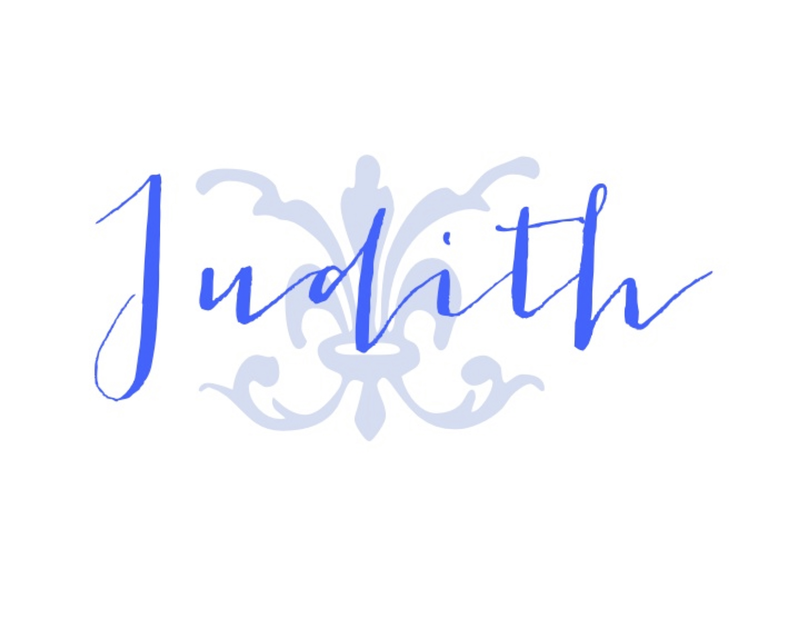 . .
Serendipity at its best, Judith! And finding the flowers is perhaps a sign of getting to the root of your issues. Let's hope so. 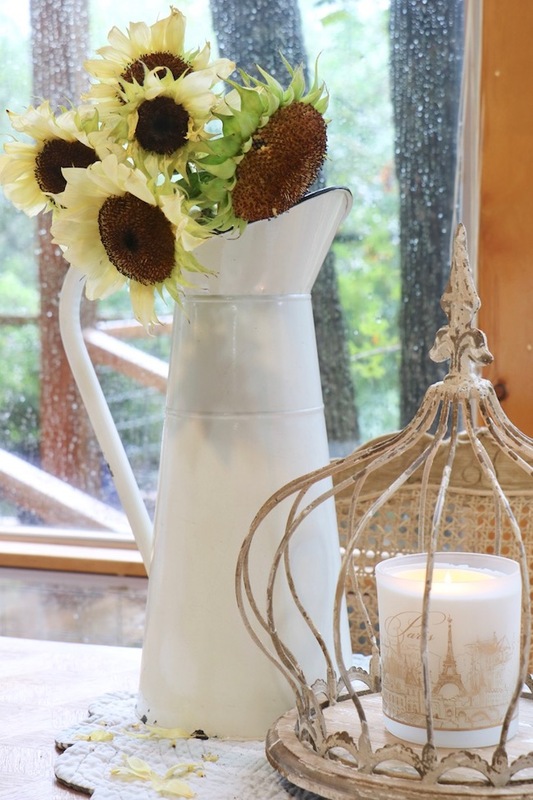 I love the bouquet's appearance, especially with the rain-dripped windows in the background. That's perfect to me. Happy Sunday. I've not seen white sunflowers. So glad you found them and they encouraged you. Love your pitcher and setting for your arrangement. Hope the doctor can clear up your problem very soon.